The fourteenth recorded perihelion passage of Halley's Comet occurred. H. Goldschmidt discovered asteroid #41 Daphne. Leroy Buffington received a patent for a system to build skyscrapers. M. Wolf and A. Schwassmann discovered asteroid #455 Bruchsalia. Orville and Wilbur Wright received US Patent # 821,393 on their airplane. 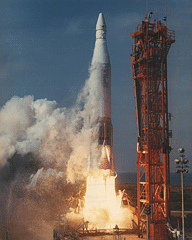 The first American rocket to escape Earth's atmosphere, JPL-Ordnance WAC Flight 2, reached an 80 km altitude, launched from White Sands Proving Ground, New Mexico. It was the first fully successful production WAC flight. L. Johnson discovered asteroid #1580 Betulia. NASA launched X-15A local flow test mission # 54 in which USAF Major Robert A. Rushworth flew to 30.602 km on a "roller coaster" flight with a maximum speed of 5552 kph (Mach 5.03) and three peaks for local airflow investigation. USSR launched Cosmos 17 into orbit "for investigation of the upper atmosphere and outer space." NASA launched the FIRE 2 suborbital reentry heating experiment. On 22 May 1965, NASA launched a suborbital reentry heating experiment using the FIRE subscale Apollo capsule. An Atlas D booster propelled the instrumented probe, called a "flying thermometer," into a ballistic trajectory over 805 km (500 mi) high. After 26 minutes of flight, when the spacecraft began its descent, a solid-fueled Antares rocket accelerated its fall. The probe entered the atmosphere at a speed of 40,877 km (25,400 mph), generating temperatures of about 11,206K (20,000 degrees F). Data on heating were transmitted to ground stations throughout the descent. Thirty-two minutes after the launch - and only six minutes after the Antares was fired - the device impacted the Atlantic about 8,256 km (5,130 mi) southeast of Cape Canaveral. The Intelsat 3 F-4 communications satellite was launched from Cape Canaveral. It was positioned in geosynchronous orbit over the Pacific Ocean at 175 deg E in 1969-1972; and over the Pacific Ocean at 166 deg W in 1977. 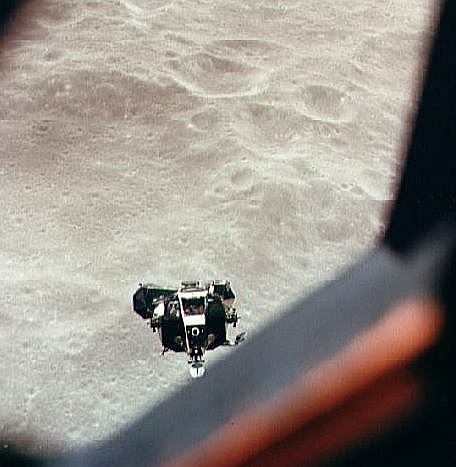 Apollo 10 astronauts Stafford and Cernan entered the Lunar Module (LM), and fired the SM reaction control thrusters to separate the LM from the Command/Service Module (CSM) for their approach to the Moon. NASA's Apollo 10 Lunar Module descended to 15.6 km above the Moon in a dry run for the Apollo 11 Lunar landing mission. USSR's Cosmos 557 re-entered the Earth's atmosphere. Cosmos 557, launched 11 May 1973, was believed to be an unmanned Soyuz-type vehicle, although the USSR denied any relationship to a manned program. It may have been launched in an attempt to salvage part of the Salyut 2 mission, to serve as a substitute for the Salyut vehicle. It transmitted on a frequency of 922.75 mh, the same as used by Salyut spacecraft. The mission was apparently completed in 4 days; the craft subsequently reentered the Earth's atmosphere on 22 May 1973. The Intelsat 4 F-1 communication satellite was launched from Cape Canaveral. It was positioned in geosynchronous orbit at 63 deg E 1976-78; at 17.0 deg W in 1978; at 18.5 deg W 1979-81; at 174 deg E in 1982; at 53 deg W 1983-84; at 50 deg W 1984-87. The US Air Force launched P76-5 from Vandenburg AFB to evaluate propagation effects of disturbed plasmas on radar and communications systems. USSR launched a Proton booster carrying the Cosmos 1100 and 1101 satellites into orbit in an unmanned test of the TKS-VA capsule. Cosmos 1100 and 1101 were launched from Baikonur on 22 May 1979, a test of the TKS-VA manned capsule with two satellites launched by a single Proton rocket. One capsule failed when the automatic system suffered an electrical distribution failure and it did not land correctly, spending two orbits in space. The other landed as planned, after one orbit. The launch again successfully demonstrated the reusability of the VA capsule. Plans to launch the upper capsule manned were scrubbed due to the inability to get two consecutive failure-free launches of the Proton/TKS-VA.
H. Debehogne discovered asteroids #2590 Mourao, #2673, #2926 Caldeira, #3138 and #3374. USSR Soyuz 40 returned its crew of cosmonauts Dumitru Prunariu (Romania) and Leonid Popov (Soviet Union) to Earth after their mission to Salyut 6. NASA launched the GOES 5 weather satellite into orbit. It was positioned in geosynchronous orbit at 85 deg W in 1981; 75 deg W from 1981-1987; 106 deg W from 1987-1988; 65 deg W from 1988-1989. Russia launched the Progress M-18 resupply vehicle to the Mir space station. Progress M-18 was launched 22 May 1993, an unmanned resupply vessel sent to the Mir space station. It was the last launch using the Soyuz-U2 launch vehicle. Progress M-18 docked with Mir's front port on 24 May 1993 08:24:44 GMT. In addition to other supplies, it carried repair equipment for a spacewalk device damaged a month before. Progress M-18 undocked on 3 Jul 1993 15:58:16 GMT, with Soyuz TM-17 docking at the same port less than two hours later at 17:45 GMT. Meanwhile, Progress M-17 remained docked to the Kvant rear port on a longevity test. Progress M-18 was destroyed in reentry on 4 Jul 1993 17:13:00 GMT. Total free-flight time 3.12 days. Total docked time 40.31 days. Russia launched the Progress M-23 unmanned resupply vehicle to the Mir space station. Progress M-23 was launched 22 May 1994 as an unmanned resupply vessel sent to the Mir space station, with a Raduga return capsule. It docked with Mir on 24 May 1994 06:18:35 GMT, and undocked on 2 Jul 1994 08:46:49 GMT. The braking engine was ignited at 14:44 GMT, and the Raduga VBK reentry capsule was ejected at 14:55:45 GMT. The Progress burnt up in the atmosphere at 14:57 GMT. The Raduga deployed its parachute after reentry and landed on 2 Jul 1994 15:09:00 GMT at 51 deg 41 min N, 59 deg 21 min E, in the Orenburg region. Total free-flight time 2.34 days. Total docked time 39.10 days. During the 5h 15m Mir EO-18-3 EVA, cosmonauts Vladimir Dezhurov and Gennadi Strekalov completed the installation of a solar array moved on May 17. Astronaut Norman Thagard then commanded the array to unfold, restoring Mir's electrical supply. During the STS-101-1 EVA, Williams and Voss reattached the US crane to the ISS, attached the Russian Strela transfer boom, and replaced a faulty antenna on the Unity node. EVA handrails were fixed to the ISS exterior for use on later spacewalks.